Please note this can be done by instructors prior to the term being put in the past. If the course is in the past, please contact Canvas@yale.edu to unlock your course. To change a course end date, navigate to Settings. Under the Course Details tab, scroll down to Ends. 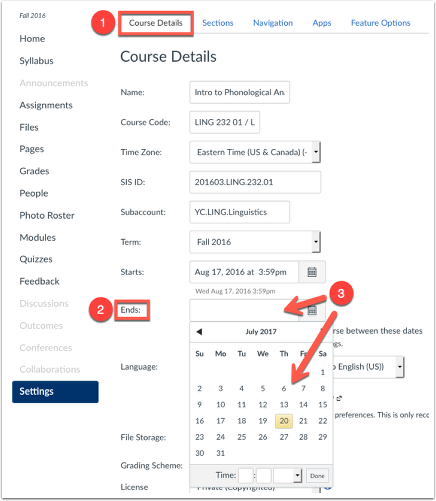 Choose a new end date for your course by typing the new date of your choice in the field, or choosing from the calendar. 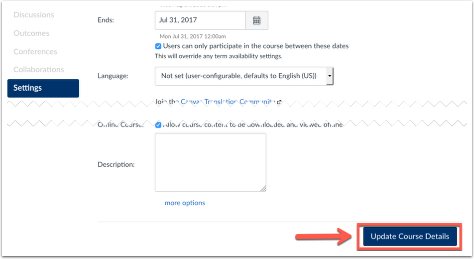 Once chosen, click the option for "Users can only participate in the course between these dates"
Scroll to the bottom of the page and choose the button Update Course Details. Prev: How Do I Create A Web-Link in My Course Navigation? Next: How can I see what the students see?